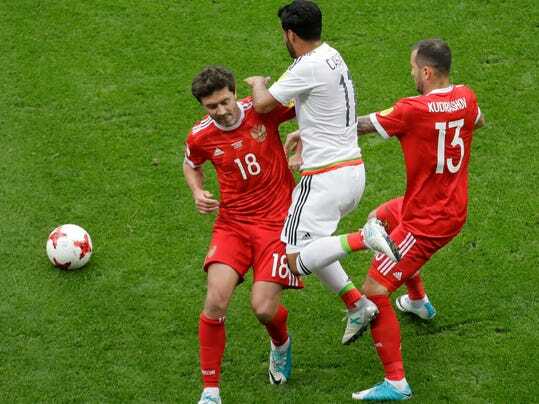 KAZAN, Russia (AP) — Host nation Russia fought valiantly but could not avoid early elimination at the Confederations Cup after a 2-1 loss to Mexico on Saturday, a result that secured the Mexicans a place in the semifinals of the World Cup warm-up tournament. Portugal also advanced from Group A after beating last-place New Zealand 4-0 in St. Petersburg. Needing a victory to advance from its difficult group, the hosts played well and took the lead with a goal by Alexander Samedov in the first half, but the experienced Mexicans equalized through Nestor Araujo before halftime and secured the victory early in the second with a goal by Hirving Lozano after a mistake by Russia goalkeeper Igor Akinfeev.